There are many reliable Magento extensions designed to create loyalty programs. Since we always filter out the best modules, let’s take a look at the Amasty’s Magento 2 Loyalty Program extension. With the help of this solution, you will be able to create unique Magento 2 loyalty programs based on various parameters to reward regular customers with exclusive discounts in the most precise manner. The module enables you to utilize flexible shopping cart rules so that you can easily generate targeted offers, consequently boosting sales and retaining more loyal customers. 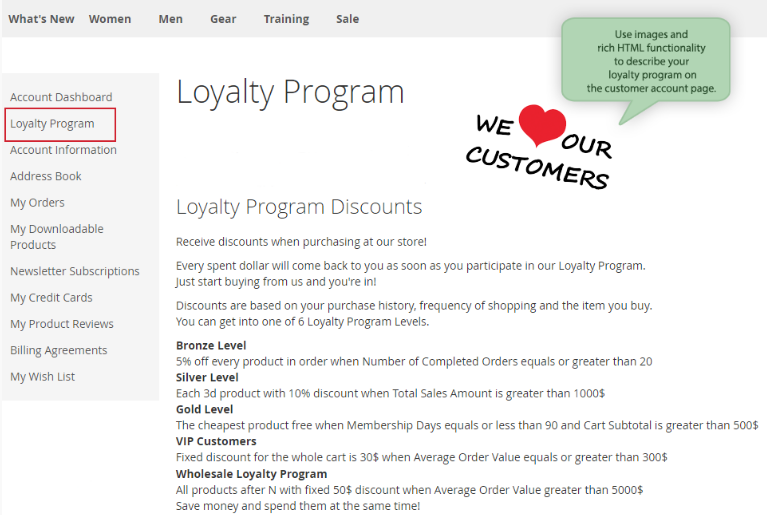 Below, we describe this Magento 2 loyalty extension in more details. Full integration with customer accounts. You can freely use various customer and cart attributes to create a very precise and effective campaign. The Magento 2 loyalty program module allows to leverage customer groups creating unique programs for each group. Besides, you can streamline different spending levels motivating customers to purchase more. Order subselection can be used for creating a Magento loyalty program as well. Amasty’s Magento loyalty extension understands the following subselection parameters: Average order value; Total sales amount; and Number of placed orders. You can use any of them to reward shoppers. It’s also a good idea to create different Magento rewards programs on the basis of each parameter. Individual offers can be created based on customer attributes as well with this Magento reward points extension. Individual promotions with personal coupons can be used to increase the level of trust to your brand. Besides, Magento 2 loyalty programs can be used as a new layer of motivation for guest visitors to register. You only have to limit access to special offers on the customer group basis. Besides, due to available 20 cart price rules, you can increase the average order amount with minimum advertising spends! Also, note that free shipping can be included into a Magento customer loyalty program. We’d also like to mention that the Magento 2 loyalty program extension by Amasty allows selecting a base price to calculate a discount. You can use either original price or special price. Furthermore, the price after previous discounts can also be used as a base price for further discount calculations. The loyalty program module also allows showing all discounts in the breakdown, so that a customer can view the name and amount of each applied discount in the order summary. This feature is especially useful for merchants who run various promotions at the same time on their web stores. As for a customer account, the module allows displaying all the necessary information about promotions right there. Thus, your clients will always know how to get some pleasant bonuses. All steps can be described in every detail so that a shopper will get a discount for sure. Note that HTML and images can be added to attract customer’s attention and turn a boring explanation into an engaging one. Another vital customer-oriented feature of Amasty Loyalty Program for Magento 2 is the ability to display statistics on customer purchases. Thus, a buyer always knows how much he or she needs to purchase to get an extra discount. As a result, merchants who implement a loyalty program with the help of this Magento 2 tool better understand customer behavior for creating effective marketing offers, generate more repeat sales on their online stores, build stronger relationships with current customers, and attract new clients without much effort. Now, when you know all the necessary facts about the Amasty Loyalty Program Magento 2 extension and its core features, we can proceed to the backend tutorial. Below, you can see all core elements from the perspective of an administrator. After the backend section, we provide a frontend tutorial as well. 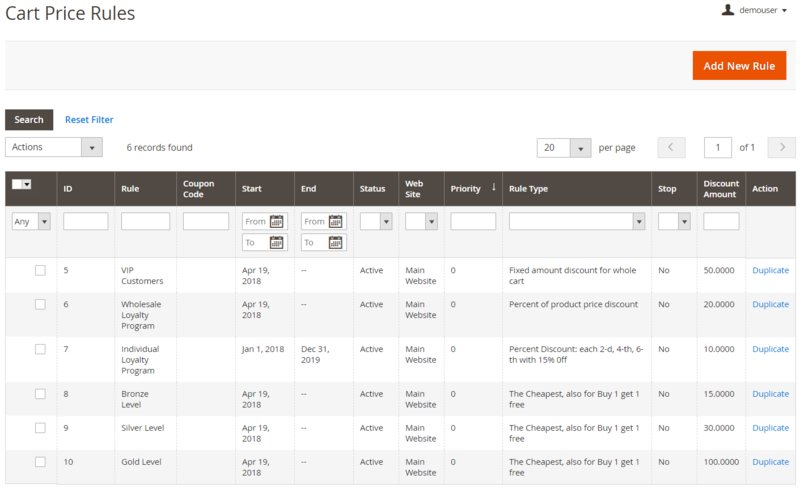 All cart price rules of the Magento 2 loyalty program extension are gathered in a grid that consists of 13 columns: checkbox, ID, Rule, Coupon Code, Start, End, Status, Web Site, Priority, Rule Type, Stop, Discount Amount, and Action. All columns support filtering and sorting. Besides, you can rearrange their order by dragging and dropping each column. To create a new cart price rule, you have to fine-tune five tabs of settings: Rule Information, Conditions, Actions, Labels, and Manage Coupon Codes. In the Rule Information section of the Magento 2 loyalty program extension, specify a rule name and description, activate the rule, and choose a store view. Next, choose customer groups to apply the rule for and add coupons if necessary. 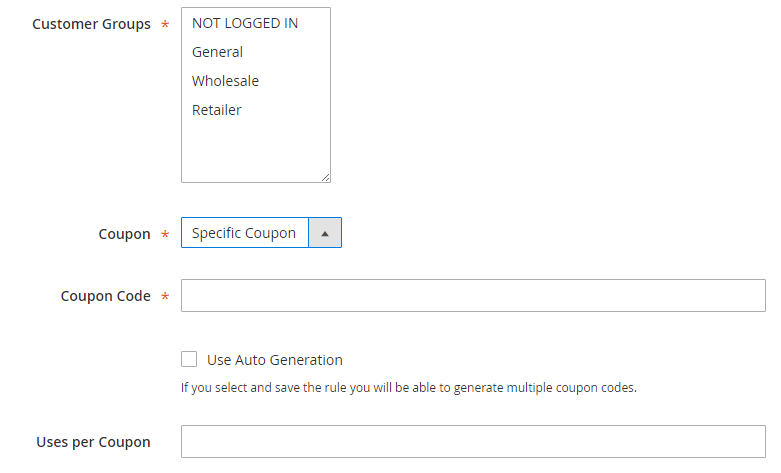 In case of a coupon being applied, specify coupon code or use auto generation and set the number of uses per coupon. Next, the Magento 2 loyalty program extension requires specifying a usage limit for logged in customers, choosing a period for the rule to be applied, setting its priority, and enabling/ disabling public visibility in RSS feeds. 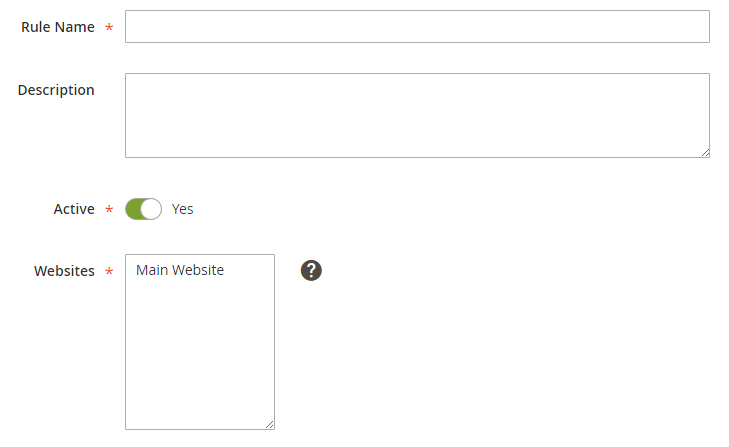 Now, you can create specific conditions to make your Magento loyalty campaign more precise. 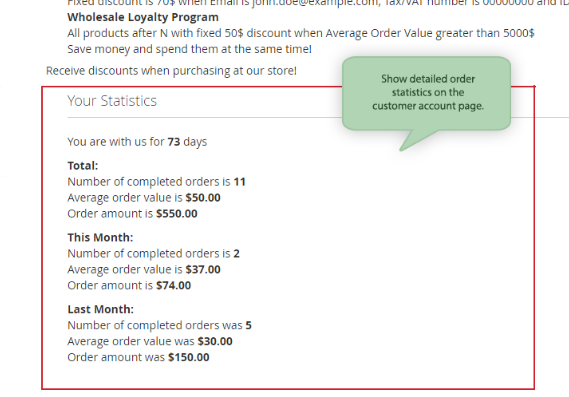 As for the Actions section of the Amasty’s Magento 2 loyalty program extension, it lets you choose and set up one of 20 actions: Percent of product price discount; Fixed amount discount; Fixed amount discount for whole cart; Buy N products, and get next products with discount; or others from 6 more groups of actions. Other options available in this section change depending on the action you choose. In case of ‘Percent of product price discount’, it includes the following parameters: Discount Amount; Maximum Qty Discount is Applied To; Discount Qty Step (Buy X); Apply to Shipping Amount; Discard subsequent rules; and Free Shipping. Also, there is an option that allows more precise customizations. Here, specify certain conditions for items to which the rule should be applied. In the Labels section, the Magento 2 loyalty program extension provides a default rule label for all store views and store view specific labels. The Manage Coupon Codes section enables you to generate coupons, specifying their quantity, a code length, format, prefix, and suffix, and characters separation settings. Now, let’s explore the Configuration page of the Magento 2 loyalty program extension by Amasty. There are two tabs here: Loyalty Program and Special Promotions. 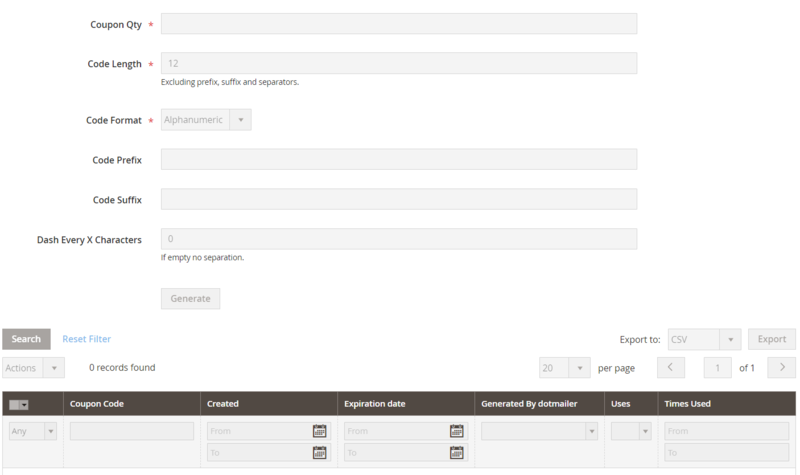 The module splits the Loyalty Program tab into the following fields: description header, description, and stats header. You can use HTML in the Description field. As for the Special Promotions tab, here you configure settings for the Magento 2 loyalty program promotions. Here, you can enable the feature that will check options values. The module also provides the ability to skip items with a special price, items with tire price, and configurable items when a child product has a special price. 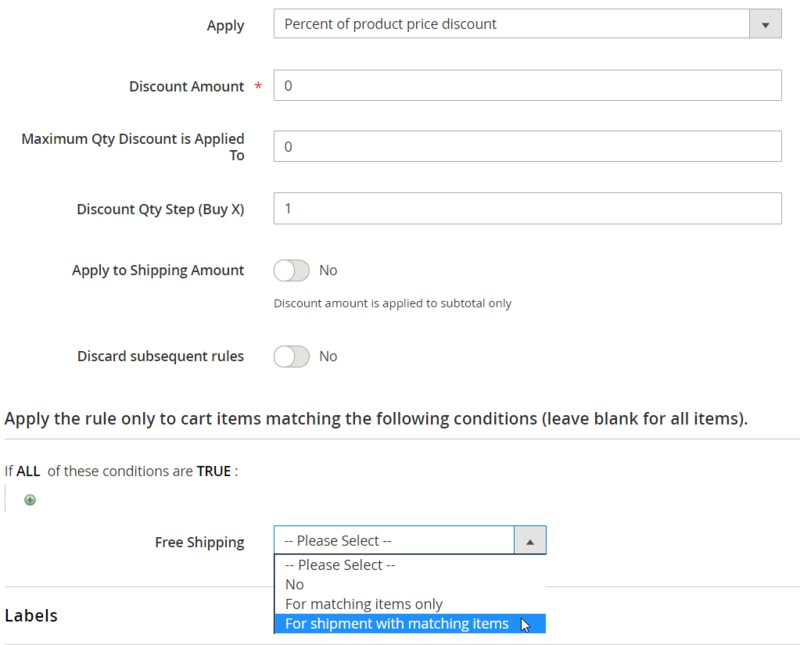 Another option here is to enable/disable discount breakdown. From the customer view, the Magento 2 loyalty program extension by Amasty is also user-friendly and intuitive. After the extension is installed, the default customer account gets a new section called Loyalty program. 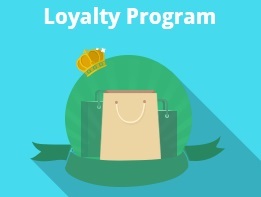 In this section, you describe your loyalty program, explaining its core features and levels. It is possible to use images and HTML to provide customers with a more eye-catching description. 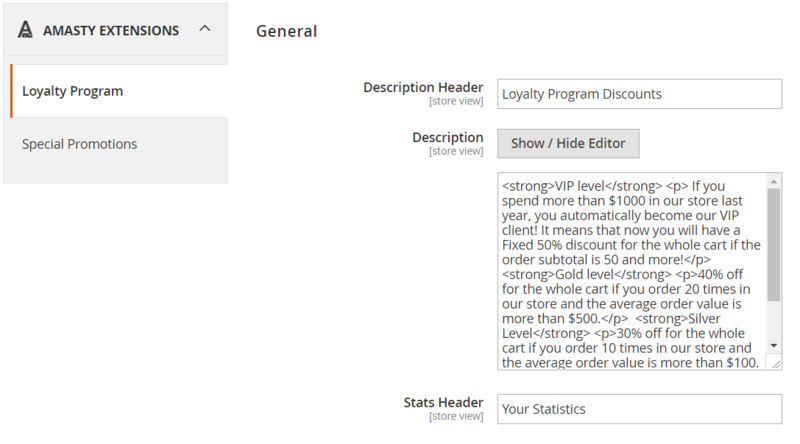 Below the description, the Magento 2 loyalty program extension offers a section with detailed order stats. New options: ‘Each N-th’, ‘Each Group of N’ and ‘Each Product After N’ actions can be configured to apply a discount to the cheapest or most expensive items first. Possibility to see promotion rules with a discount breakdown in the customer account was implemented. The extension is compatible with Amasty Customer Attributes now. An attribute ‘Customer ID’ was added to rule conditions. The Amasty Loyalty Program Magento 2 extension is easy to configure and use. The module has all options necessary to customize its functionality according to the most demanding business requirements. Hence, your Magento loyalty program can be fine-tuned in the most precise way: by adding several levels, you will engage your customers to purchase more, boosting sales and turning one-time buyers into returning customers. Considering all the mentioned above features, we are sure that $249 for the Magento 2 loyalty program extension and $129 for its Magento 1 predecessor are quite reasonable prices.